By 2019 Mountain View will have a dedicated bus lane on Shoreline, and major bike safety improvements on the corridor, to help reduce car traffic to the employment center, according to a recent community meeting. The bus lanes will run on Shoreline Boulevard between Middlefield Road and Plymouth Street. The lane would run in the median and not replace any existing vehicle lanes (see diagram).The project will involve upgrade to traffic signals and a potential for buses to get priority timing but the specifics of the signal upgrade have not been completely finalized. The project is has a price tag of $26.5Million, and is fully funded out of impact fees from development. Â Design and engineering are expected to be done done by the Summer of 2017, and construction will take an additional two years, for expected completion by the Summer of 2019. 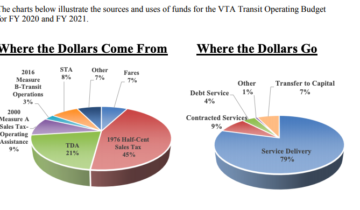 Â Â Eventually, the bus lane is expected to be replaced by a higher capacity transit link. 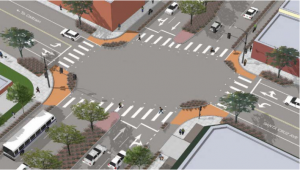 In addition to the improvements for bus/shuttle service there are major improvements proposed for bicycling, including a protected intersection at Shoreline and Middlefield. Bike lanes from Middlefield to Terra Bella will be upgraded to 6â€™ wide protected bike lanes with 4â€™ wide raised buffer. Bike lanes from Terra Bella to 101 interchange will be upgraded to 6â€™ wide. Bike lanes on 101 interchange will be upgraded to 7â€™ wide. Bike lanes from La Avenida to Pear will be upgraded to 6â€™ wide. 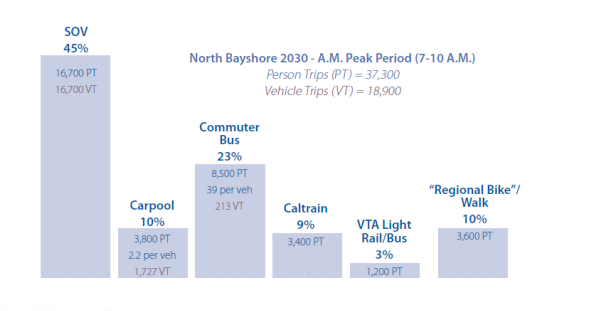 The bus lane and bicycle improvements were among the key recommendations from the Shoreline Corridor Plan, as part of a comprehensive improvements intended to achieve Mountain Viewâ€™s ambitious goal to reduce solo driving to North Bayshore to 45%. Protected bike lanes are nice, but they don’t cover the most terrifying part of a trip down Shoreline, which is crossing over the high-speed freeway entrance lanes. That needs to be addressed before we can expect a significant increase in bike commuting.